If you’re like me and somewhat oblivious to trending topics on Twitter, you may be wondering why gory photos have been popping up on your feed captioned with #ThisIsMyLane. 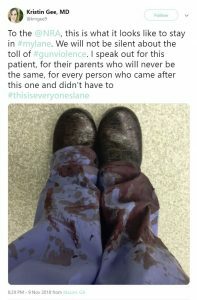 Well, a recent post made by the National Rifle Association’s (NRA) Twitter account has inspired a shocking social media movement among medical professionals. Needless to say, this caused extreme outrage. Doctors, surgeons, and other various members of the medical community responded with graphic photos and confessionals regarding how firearms affect them every day. Due to doctor-patient confidentiality, the photos tend to be a bit abstract, yet are haunting nonetheless: bloodstained scrubs, bullets pulled out of victims, or clocks showing a time of death. Captions posted with the photos and the released confessionals go into detail conveying how the shocking sights and heart-wrenching tales of loss are an everyday occurrence for anyone working in a hospital. She was met with immediate criticism, not only from medical professionals but from the public at large. Her statement was labelled insensitive, ignorant, and cruel—and did very little to earn her any favour when those doctors turned their anger towards her. 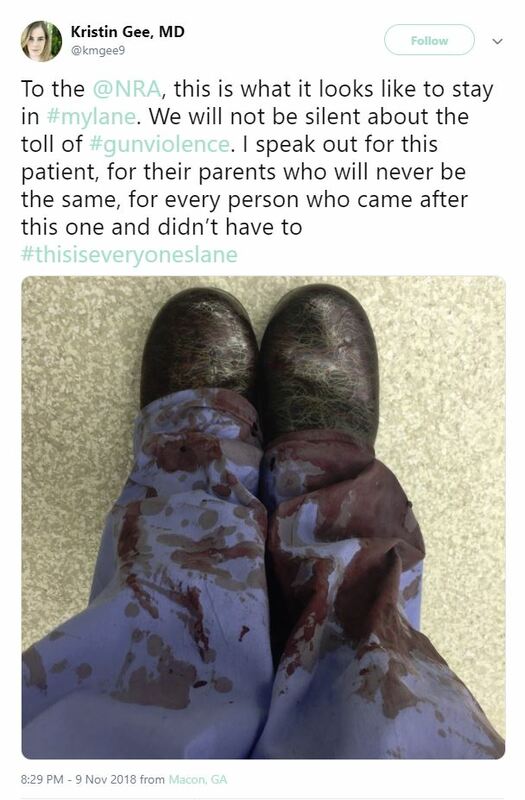 Twitter rants and name-calling aside, #ThisIsMyLane has done an excellent job of bringing awareness to the everyday reality of gun violence. More importantly, it is keeping public attention on the issue of firearms and gun control without tying it to the latest mass tragedy.